Looking for a gift that will pamper your mom this Mother's Day? 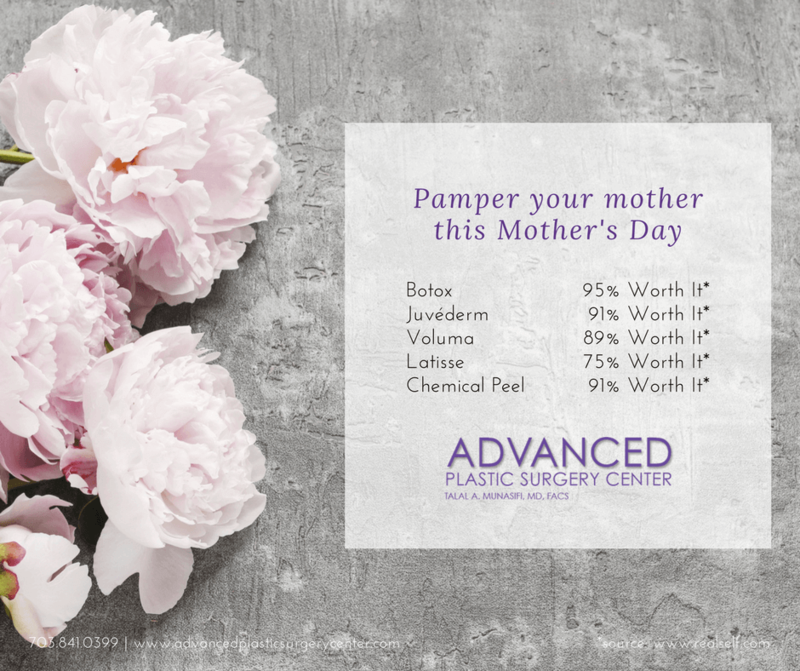 Advanced Plastic Surgery Center created the below infographic that includes five non-surgical procedures that make great gifts for Mother's Day! Your mom is sure to feel pampered with a range of procedures like Botox, Juvederm, Voluma, Latisse, and chemical peels. For more information on any of these procedures, contact Advanced Plastic Surgery Center. Botox Cosmetic is a non-surgical treatment that is used in softening the signs of aging, such as frown lines, forehead lines, and crow's feet. Treatments are relatively quick, lasting around 15 minutes, and results can be seen for up to four months. Botox has a 95% RealSelf.com Worth It rating. Juvederm is a collection of dermal fillers that contain hyaluronic acid to provide smooth, long lasting results. Juvederm can be used to treat a variety of areas on the face such as smile lines, deep folds, vertical lines, lip enhancement, wrinkle correction, and shaping facial contours. Juvederm has a 91% RealSelf.com Worth It rating. Part of the Juvederm family of fillers, Voluma is FDA-approved for treating large areas of the face including the midface and cheeks. Voluma is also made with hyaluronic acid to provide natural-looking results. Voluma has an 89% RealSelf.com Worth It rating. For thicker, darker, and longer lashes, try Latisse! Latisse is a topical solution that encourages the growth of your natural eyelashes. Full results will be seen in 12-16 weeks after the start of the treatment, however, you will begin to notice results after the fourth week. Latisse has a 75% RealSelf.com Worth It rating. Chemical peels can treat a range of skin concerns including uneven skin tone, fine lines, wrinkles, large pores, acne, and more. We offer a variety of chemical peels, ranging from mild to medium exfoliation, so we can best treat your skin concerns. Chemical peels have a 91% RealSelf.com Worth It rating.